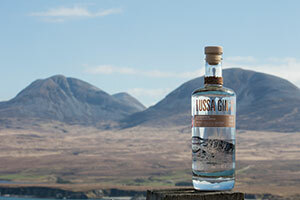 A gin meticulously crafted from 15 botanicals sourced from the secluded isle of Jura, off Scotland’s Wild West coast; Lussa Gin tastes as fresh as the maritime temperate climate it originates from, and is as much an adventure in flavour as it is an adventure in creation in the distillery at Ardlussa. A true labour of Lussa, this gin has been crafted by artisans Alicia MacInnes, Claire Fletcher and Georgina Kitching; and since its inception in 2015 has won numerous taste awards including the Gold 2018 award at Scotland’s Speciality Food Show. This is thanks to the fact that each of the 15 botanicals that infuse to create Lussa Gin’s distinct flavour are grown and foraged from the Isle itself, making Lussa Gin a true product of the isle. The success of Lussa Gin continues, as they recently made it in to the Top 20 exhibitors at this year’s Imbibe Live at London’s Olympia exhibition centre, on the 2nd-3rd July 2018, where attendees and exhibitors alike were incredibly impressed by the fresh, zesty, smooth gin taste with a subtle, aromatic finish on the pallet. To be recognised at Imbibe Live, Britain’s leading trade event for providers, buyers and servers of alcoholic drinks, is an outstanding achievement, and truly a sign of things to come from Lussa Gin – An Adventure in Gin. For greater insight into the backstory and inspiration that went into this stunningly crafted, flavoursome Lussa Gin, visit the below website, or if you’d like to get in touch with the distillers directly and learn more about stocking Lussa Gin, or maybe enquire about visiting their distillery, call or email today. This entry was posted in News and tagged Imbibe Live. Bookmark the permalink.